The Early College Academy (ECA) enrolls students beginning in grade 9. Successful students complete high school with a high school diploma (or its equivalent) and an Associates of Arts degree in General Studies from Cecil College. Prior to their freshman year, ECA students participate in an orientation program to introduce them to academic expectations and resources available to them during their four years in the program. Throughout their enrollment, students are supported by tutors and advisors from Cecil College. While taking classes, students are guided through seminars and individualized advising to help them build the academic skills needed to succeed in high school and college coursework. Cecil College has three separate Early College Academies. The first began in the 2014/2015 in partnership with Oxford Area School District in Pennsylvania. The second academy began in the 2017/2018 with local homeschool families and our third academy began in 2018/2019 in partnership with Cecil County Public Schools. 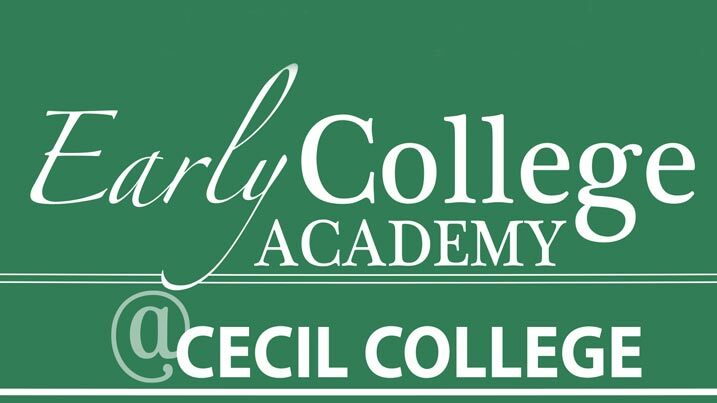 For 8th grade students interested in enrolling in one of Cecil College's Early College Academies, the process varies depending on where they plan to attend high school. Students planning to attend Oxford Area High School can find information about enrolling in ECA on oxfordasd.org. Students planning to attend a Cecil County public high school can find information about enrolling in ECA on ccps.org. Homeschool students can find information about enrolling in ECA below. The ECA application packet includes all the steps and forms needed to apply. Submit the documents contained in the application packet by July 15th. Incomplete or late applications will not be considered. Note: No preference will be given for early applications. Applications will only be reviewed for completeness prior to the application deadline. All applications for acceptance will be evaluated at the same time. Email as a PDF attachment to April Stern, Assistant Director of Advising/ECA Coordinator, at astern@cecil.edu. Accepted students will attend the mandatory orientation night at Cecil College in August. ECA schedules will be provided the night of orientation. If you have any questions or want more information about ECA, please contact April Stern at (410) 287-1045 or astern@cecil.edu.